Apple users may suffer from data lost due to various reasons, like accident deleted, iPhone damaged, upgrade to iOS 10 failed, etc. Once you lost or deleted data on your iPhone/iPad/iPod, you will search for the method to recover lost iOS data. When it comes to recover iOS data, Wondershare Dr.Fone is the first one that will come to your eyes. This software is the world’s first data recovery software for iPhone, iPad and iPod Touch. What can Wondershare Dr.Fone help you? As the iOS data recovery software, Wondershare Dr.Fone is able to recover up to 19 types of data in your iOS device, including Contacts, Messages, Notes, Photos, Videos, WhatsApp, Facebook Messenger, etc. This tool provides you three recovery mode for you to recover and extract data directly from iPhone/iPad/iPod and from iTunes/iClould Backup. Wondershare Dr.Fone is compatible with iOS 10, iPhone 7 and all kinds of iOS devices. However, When you use the free version of Wondershare Dr.Fone, you may find that if you want to extract the data from the software, you need to purchase the full version and it is quite expensive. Besides, when you first connect your device with the software, it may not recognize the device. 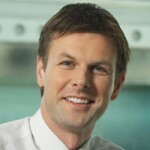 During the scanning process, it is quite slow if you have large database, and it may crash during the recovery. Then you may want to find the similar software to Wondershare Dr.Fone. Here we find the best alternative to Wondershare Dr.Fone, iRefone, or iRefone for Mac to help you recover iOS data effectively. 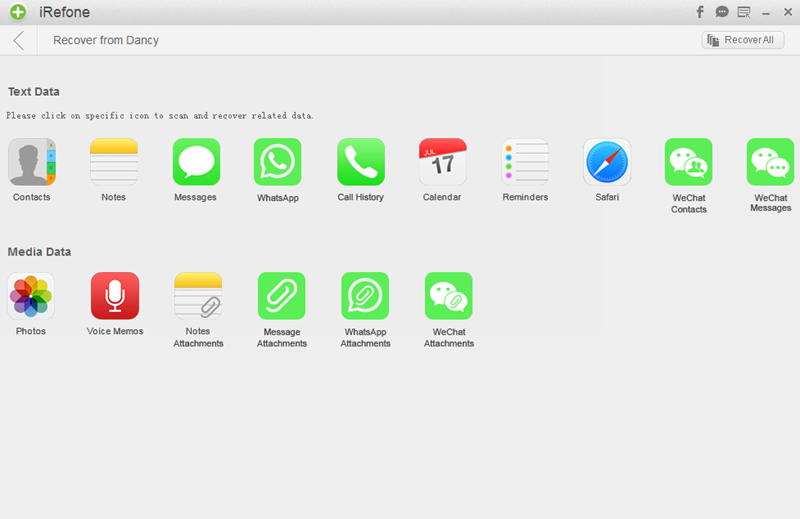 iRefone is the superb alternative to Wondershare Dr.Fone as it is enable to recover all of the data in your iOS device, including the WeChat data which Dr.Fone can not supported. With the user-friendly and easy to use interface, iRefone provides quick recovery of data in certain ways. Besides, this software also allow you to transfer recovered Contacts, Messages, Notes directly back to your device without any other help. iRefone is very easy to use even you are the first time to use this software. Just need 3 steps, you could recover iOS data back. 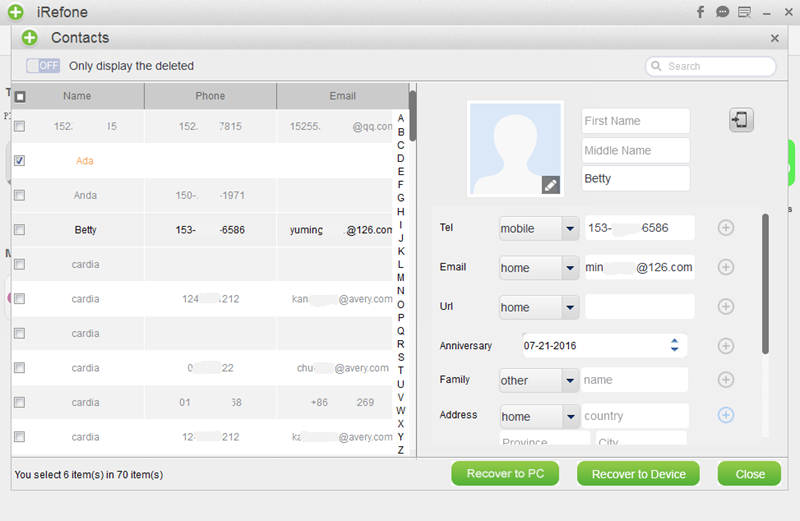 After downloading and installing iRefone, run it, you could see the interface as follows. 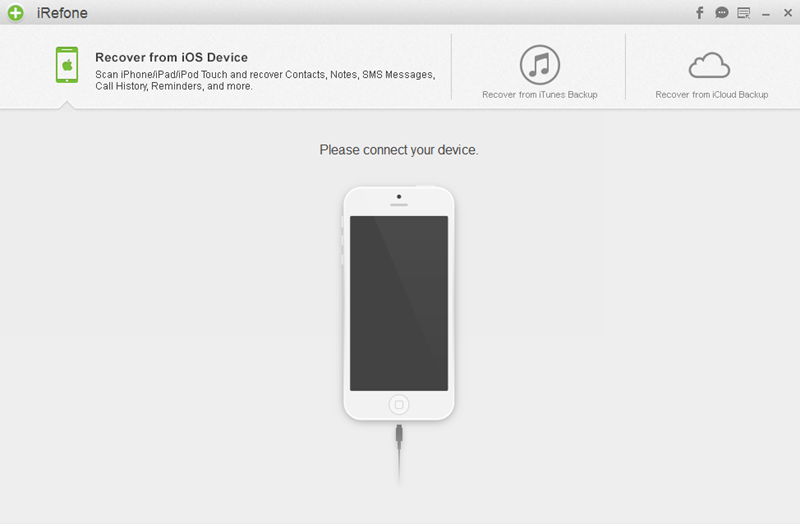 It provides you three recovery mode: Recover from iOS Device, Recover from iTunes Backup and Recover from iCloud Backup. You could choose the suitable mode for you to recover your lost iOS data. When you choose the recovery mode you need, you will enter into the interface to ask you select the data you want to scan. Just click on the icon of the data, and then the software will automatically start the scanning process. When the scanning is finished, all of the data that you choose will be displayed in the interface of the software. You could preview them one by one and select these data you need to save them to PC or device as you like. A short wrapup would be that both Wondershare Dr.Fone and iRefone are impressive tools for iOS data recovery, but if you have to choose a winner that would be iRefone/iRefone for Mac because of its low price, easy GUI and more features. Don’t forget to try it before purchase!